Theo Kgosinkwe, "A lasting force on the SA Music scene", at Carnival City Presented by Breakout Management. On 18 February 2012 Carnival City will be set alight when four of SA’s most talented performers take centre stage in the second presentation of the popular One Night in Africa concert series. 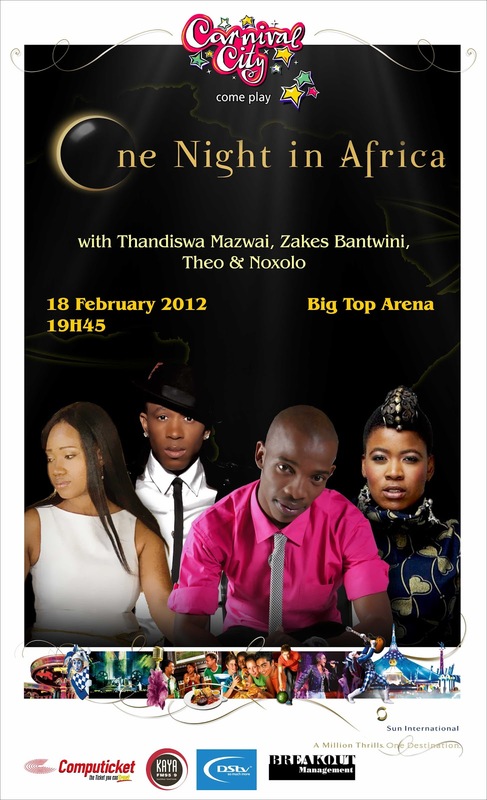 For one night only, experience Mzanzi’s finest artists under one roof in celebration of the month of love. The concert is proudly presented in partnership with DStv Compact and Kaya FM. Theo Kgosinkwe, better known for being the other half of popular group Mafikizolo, is a singer, songwriter and has composed songs for some of SA’s top musos, like the late Busi Mhlongo, Thembisile, Unathi, and Hugh Masekela amongst others. Kgosinkwe has released two solo albums, I AM and Grateful, and each has made a commendable impact. I AM was voted Best Pop Album at the 2009 MTN SAMA Awards. Theo’s latest single, Thinking About You, is also enjoying a lot of airplay on SA’s top radio stations and TV channels. Theo will be bringing it on, perfoming hits like Umphathe Kahle, Sengimtholile, Thinking About You and Ukhona. Thandiswa Mazwai, a multi award-winner, is known for her upbeat and revolutionary music. Mazwai has built a successful solo career after releasing five albums with Bongo Muffin, and is known for her eccentric dress sense and Xhosa inspired tunes. Mazwai will perform hits like Zabalaza, Ndilinde and many other notable tracks. Funky Durban-born musician Zakes Bantwini is one of the first people who introduced South Africa to what is currently known as Durban Kwaito Music (DKM), a fusion of house beats blended with kwaito lyrics. Zake’s music has been dubbed “sophisticated dance music”, and will blaze the stage, performing hits such as Bum Bum and Wasting My Time to name just a few. Up and coming jazz and afro-soul artist Noxolo Hlatshwayo was born and bred in Cape Town. She started off her music career as a backup artist for Steve Kekana. She has also worked with the late Vuyo Mokoena and has performed alongside Rebecca, Lusanda and Deborah Frazer at the SAMA Awards in 2006. One Night In Africa is one night you don’t want to miss. Be sure to come and witness South Africa’s Fantastic Feb Four live in concert. Book Today: Tickets are R245 and R285 at Computicket and Shoprite Checkers. Breakout Management | ZenOne Productions in Association with GoXtra News are giving away a double ticket to the One Night In Africa event. ©The views expressed above DO NOT in any way represent GoXtra News, but that of the concerned writer/press release issuerer. For publication errors email: publisher@goxtranews.com/ for editorial editor@goxtranews.com. Follow us on twitter here for more information send your email to info@goxtranews.com.